Recently we reported on Capcom’s tease in relation to a three-pronged weapon, a new one to be included in Monster Hunter 4. This weapon has now been revealed in Famitsu as the Charge Axe. Like the Switch Axe, it can swap between two modes: Sword Mode and Axe Mode. Sword Mode plays similarly to the Sword and Shield seen in previous games. Players hold a sword in one hand and a shield in the other. The sword can be used for rapid attacks and the shield to guard. The difference between the Sword and Shield and the Charge Axe’s Sword Mode is that dealing damage in Sword Mode charges the weapon. When it becomes fully charged, the player will be able to use a powerful attack which uses both the sword and the shield. Axe Mode is slower but more powerful and also has more reach. Its regular combo will have a powerful finish capable of stunning your foes. Charge Axe users have a bottle hanging from the hilt of their blade. When it starts to glow yellow, it indicates that the weapon is fully charged and a powerful attack can be let loose. 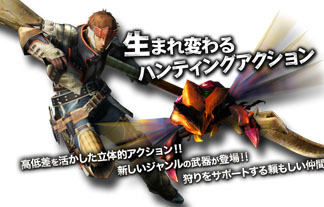 Monster Hunter 4 will be released for Japanese 3DSs before E3 next year.